What is this perceived need to share really about? Thanks so much, Carol. I’ll be honoured to know that your granddaughter is reading it. Thought provoking, Carol. Thank you. Perhaps it’s because I know that silence is often the wiser choice… You are so wise my friend. Dear Trace, I so appreciate your kind and thoughtful words, but I truly don’t see myself as wise. I couldn’t resist the temptation to reply with a bit of humor. I think you would really like this poem by Victoria Safford entitled “The Gates of Hope”. I found it by googling her name and scrolling down until I came to The Gates of Hope/ Stanford Social Innovation Review. Thank you so much for sharing this powerful poem, Joan. I’m adding a link in case anyone else is intrigued: https://ssir.org/articles/entry/the_gates_of_hope. Wonderful reflections. 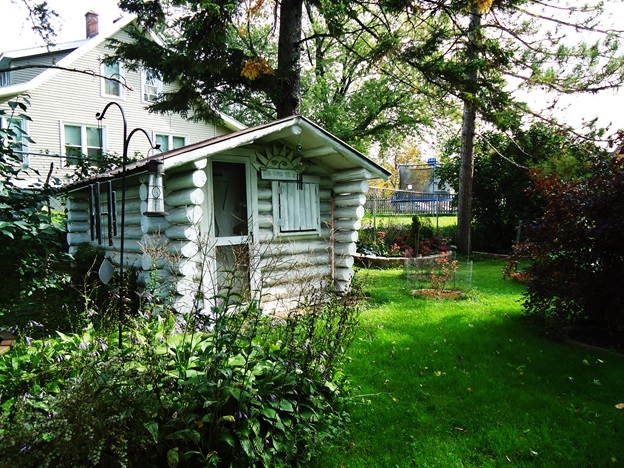 I like the little log cabin. The way the logs are cut at the front gives the impression that the building is leaning over… ! Thank you for your kind comments, Sha’Tara. The shed is a fascinating building. I understand it is a replica of a Swedish building, built by the original owners of this house to honor their ancestral homeland. The serenity and happiness of your environs virtually envelope me as I weave my way through your words, Carol. May the annoying tumult leave you undisturbed, like droplets of water gliding off lotus leaves, and keep you appropriately energized for everything interesting. yes, deep peace and grattitude, what a beautiful post. Thanks Carol…. similar feelings, thoughts, observations, desires, doubts, despair(s). And I appreciate your sharing this, deeply. Somehow, you bring me hope. Sometimes it’s enough to spend time enjoying those moments of peace and gratitude without feeling the need to share them or put words to them – though these ones are lovely. It has been some time since I read your blog. Because, as you describe here, my reserves are also depleted and I must often shift into survival mode. I so appreciate your words and wisdom. They are like rations for the soul.